From magazine clipping, snapshot of an interesting shape, a rough sketch, detailed drawing or a design we work out together, if you can imagine it, we can build it. 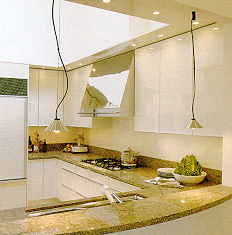 The process of creating your custom range hoods will start with a technical review. Design objectives, ventilation requirements, motor placement, lighting, mounting system and the like are carefully analyzed. 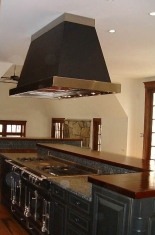 The completed design then passes to the hands of our master craftsmen to form your one-of-a-kind range hood. From ABBAKA’s Custom Metalworks. Complex engineering allows the hood’s canopy to cantilever elegantly to the right of the flue. The ventilator motor is moved outside the hood and mounted on the roof of the home. There are few today who have the skills required to perform the arduous task of forming, joining and polishing sensitive materials such as mirror stainless. It is one thing to fold a straight standing seam of thin material. Quite another if on a curved surface. Nearly impossible if this is a stainless add-on. 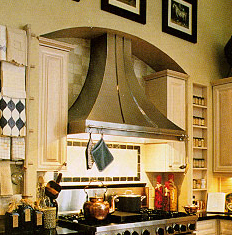 This original, custom design makes a perfectly conical hood seem to hover in space. 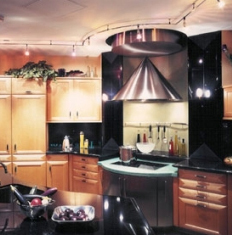 A classic matte black canopy is accented by an offset apron and rectangular crown of satin brushed stainless steel. A commercial baffle filtered liner powered by our Hy-Ex remote ventilator completes the perfect recipe for this custom range hood.